Stateside, things have been a bit rough, what with a tanked economy, a politically charged climate and strident divisions of opinion on how to deal with our basket full of problems. Victory gardens aside, my hope is for everyone to tighten their fashionable belts and save their pennies by spending wisely. Sacramento boutique Cuffs has a little patriotic incentive to shop their online shop this weekend holiday. Go to shopcuffs.com and save some green. 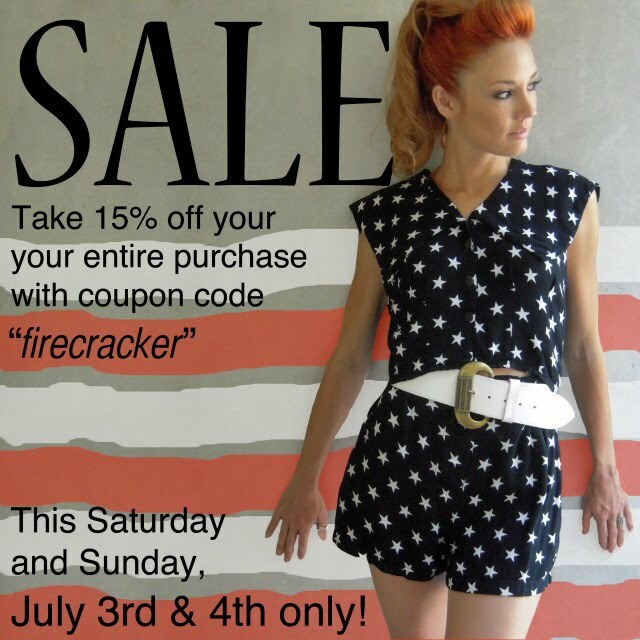 Mention "firecracker" when you checkout and get 15% off your purchase. On a very happy note, it was quite a treat to get a mention on Become.com as a "Style Blogs of the Week." Featured are some really wonderful bloggers, and I'm honored to see the Citizen Rosebud counted among them. 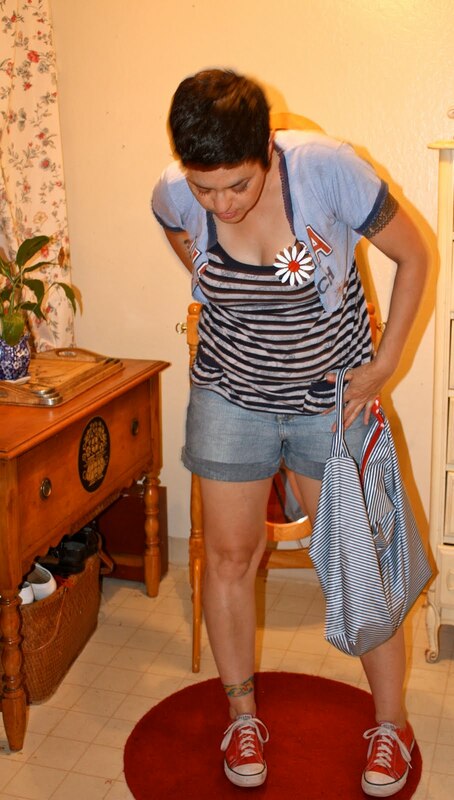 Included is one of my favorites, local stylista extraordinaire, Lisa M of Starship Narcissus. She has incredible style and rocks a finely curated thrift-store clothing collection, as well as being an intensely lovely person. 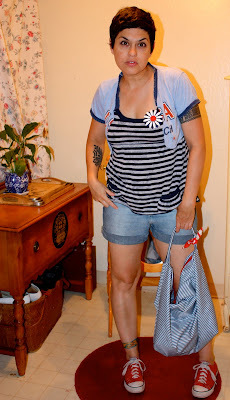 Here, I sm, showing you my American Casual outfit. I wore this to work today. Still sporting the stripes ala Americana, The shrug was an old ringer tee that said "USA COACH" Now is says: your arms are covered." Wow I like your outfit (: That jersey is fab! congrats on getting mentioned. i love your daisy pin!! There's something about Daisies that to me screams "USA!" I would LOVE to have a star-spangled romper like on that flyer! I love your solution of victory gardens. We grow so many of our own vegetables, which cuts down on the gas that needs to be used to transport produce. Sorry to tangent but I can barely turn on the TV to look at whats going on in the Gulf its so sad. Congrats on your recognition. You so have the 4th covered- we should create a 1st week of July where all you can wear is r w & b stuff! Have a great 4th!!!! Thank you all, dear friends. I so appreciate EVERY comment you make, and all the support and positive words you share. It really means a lot. The flower is a hoot isn't it? I now have a budding collection of these little '60's pins. One of these days I need to do a feature on them. Congrats on the mention! Exciting stuff. Still loving the stripes. I love that American flag dress on your previous post. Super cute! Thanks you TEF, and Estefany! Like the outfits. You are very creative and stylish, it's great to see you have so much fun getting dressed up. The party's on and ISQUISOFRENIA rocks!